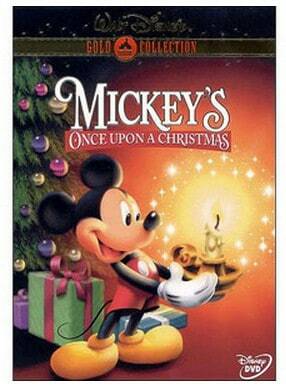 The Mickey's Once Upon a Chirstmas DVD is on sale for $13 at Walmart.com right now. That's 35% off the regular price of $19.96! Disney's biggest stars shine in a magical, heartwarming movie sure to become a holiday classic! Mickey, Minnie, and their famous friends Goofy, Donald, Daisy, and Pluto gather to reminisce about love, magic, and surprises in three wonder-filled stories of Christmas past. In the fine tradition of Disney's superb storytelling, Minnie and Mickey recall the year they both gave up what was most important to them for the sake of the other, making for one unforgettable Christmas. Goofy and Max retell when they experienced a series of hilarious but season-shaking events…until a visit from the real Santa made it a most magical holiday. Thinking back to when they wished Christmas was every day, Donald's nephews Huey, Dewey, and Louie remember their dream turning into a comical catastrophe, eventually teaching them what true holiday spirit is all about. Featuring the entire cast in a finale of merry, magical Christmas songs – all the excitement of “Mickey's Once Upon A Christmas” is ready to unwrap for holiday family fun.